The chao (simplified Chinese: 钞; traditional Chinese: 鈔; pinyin: chāo) was the official banknote of the Yuan dynasty in China. Unlike the earlier paper money such as jiaozi, it was the first paper currency to be used as the predominant circulating medium in the history of China. 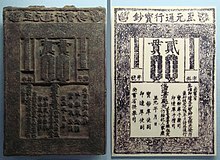 The primary press was the Imperial Mint established in 1260, probably in Yanjing. It was certainly located in Khanbaliq after that city was established the same decade. Regional capitals were sometimes authorized to print money as well. The money of the various eras of the Yuan were also separately known, as the Zhongtong notes and Zhiyuan notes of the reign of Kublai Khan. The chao banknotes were initially backed by silver but as the demand for them grew they became a fiat currency and weren't backed by gold or silver. It was this money that was described by Rustichello in his account of the travels of the Venetian Marco Polo. Later in 1294, in order to control the treasury, Gaykhatu of the Ilkhanate in Persia attempted to introduce paper money in his empire, which imitated the Chao issued by the Yuan dynasty so closely that they even had Chinese words printed on them. However, the experiment proved to be a complete failure, and Gaykhatu was assassinated shortly afterward. ^ "Paper Money in Premodern China". 2000 ff. © Ulrich Theobald - ChinaKnowledge.de - An Encyclopaedia on Chinese History, Literature and Art. May 10, 2016. Retrieved February 6, 2018. ^ "Trade and Currency under the Yuan". Boundless. June 17, 2014. Retrieved June 14, 2017. ^ "10 March 2015 What Wall Street Can Learn From The Mongol Empire". Kabir Sehgal (for the Observer). Retrieved February 6, 2018. ^ "The Invention of Paper Money - History of Chinese Currency". Kallie Szczepanski (for ThoughtCo.). March 8, 2017. Retrieved February 6, 2018. ^ "The History of Paper Money – Part 2: Not Just Noodles". One Percenter (for One Percent). February 16, 2017. Retrieved February 6, 2018.